Item is from smoke free house. Once you are done. Made by Hasbro in 2008, this toy is unopened and in good condition. You are looking at a new, sealed GI Joe The Rise of Cobra PIT Mobile Headquarters set. There is some minor box damage due to initial shipping from my distributor. The toy will be shipped bubblewrapped and boxed in its initial shipper box for secure delivery. Trending at C $45.13eBay determines this price through a machine-learned model of the product's sale prices within the last 90 days. Trending at C $18.86eBay determines this price through a machine-learned model of the product's sale prices within the last 90 days. We most certainly able to solve any issues. Details : For sale is (1) 2006 G.I.Joe DTC Viper Pit Cobra Viper, loose and incomplete. COBRA VIPER PIT - COBRA VIPER. GI JOE . INCLUDES FILE CARD. check out the pictures for close up detail . I do not claim to be a professional grader of toys, HOWEVER this is a Good piece in nice condition. No file card is included. GI Joe Cobra ROC Rise Of Cobra Figure Lot Pit Commando x3 Army Builder NEW. x2Variant Condition is New. Shipped with USPS First Class Package. 25th, 30th, 50th, Rise of Cobra, Retaliation, Resolute, Pursuit of Cobra, SDCC, Convention, JoeCon, Exclusives, FSS, Kre-o's and MORE.NOW WITH MARAUDER TASK FORCE VALKYRIES! New ListingGI JOE Rise of Cobra, Cobra Neo-Viper. Hasbro 2008. (unopened). All original. Stickers are unused. GI Joe POC Attack on the Pit Head Quarters TRU Exclusive Neo Viper Officer and Neo Viper Commando. We've been collectors our whole lives. We are a family owned and operated organization. We are very reasonable to work with. Condition can be seen in the photo or in title. Just wait for an updated invoice that we will send out to you we might even be able to give you a cheaper rate. You must write us first and we will let you know what to do. This is in great condition! Cobra Neo-Viper GI Joe Rise of Cobra Attack on GI Joe Pit Hasbro New. Condition is New. Shipped with USPS First Class Package. This is the perfect lot for any collector, or a customizer looking for parts. 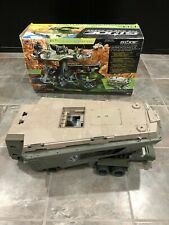 Up for grabs, is this GIJOE vehicle/playset, that was made by Hasbro for 2009 series. Contains lot of stickers and has a great transformation from vehicle to base! There's light surface wear from storing and a small old semi-removed price sticker on one side. ITEM IS IN GOOD CONDITION (SEE PICTURES). YO JOE ! One of his arms is a bit loose. Very nice set of gear. Mint on card - S.E.A.L. Gear. NOT a full scale replica. By ordering, you agree to these conditions. NOT fit you! See the ruler in the picture. GI JOE Rise of Cobra, Cobra Neo-Viper. Hasbro 2008. (unopened).